Regulatory and reimbursement forces have driven hospitals and health systems to pursue new alliances, affiliations and ownership options to ensure their survival and continued market success. The need for comprehensive, accurate hospital valuations, physician valuations, and other FMV and transaction advisory services has never been greater. Whether your hospital or health system is looking at new, cost-effective integration, consolidation, or strategic partnerships – or assessing innovative, outcomes- or value-based payment arrangements, VMG Health has the experience and depth to inform and guide your decisions. And we stay current on the latest market trends, regulatory nuances, and their financial implications, so you can be confident that your evolving transactions and valuations are fully compliant and up-to-date. VMG Health provides valuation and advisory services along every step of a transaction including feasibility studies, transaction valuation opinions, physician compensation arrangements, real estate and capital asset appraisal. 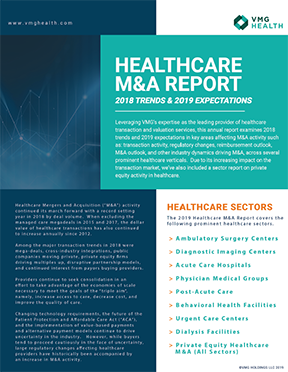 This annual report examines 2018 trends and 2019 expectations in key areas affecting M&A activity, including a sector report on private equity activity in healthcare.